This large-sized tube has an unusual B26A 26-pin base. It will fit B26A, B27A and some B17A sockets. All the active pins are in the outer 17-pin circle. The digits are 30 mm. high. See also: Bulk gas illumination. 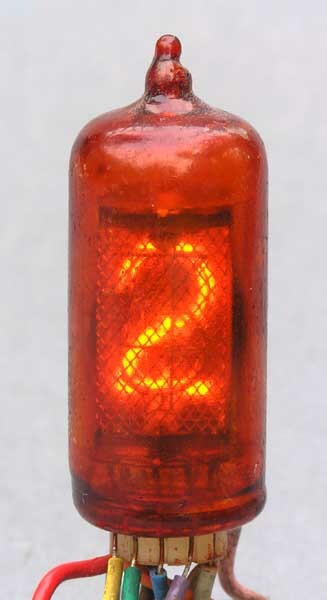 A sub-miniature wire ended Nixie with 8 mm. digits. Side view 'Numicator' with 14 mm. digits 0-9 (no decimal point). Similar to the GN6 but the current rating is lower. Cathode currents should be in the range 0.7 mA (for full coverage) to 1.2 mA (average). The normal maintaining voltage is 115 V.
Side view 'Numicator' with 14 mm. digits 0-9 (no decimal point). Replacement for the XN1. Similar to the GN6 but the current rating is lower.